Only a short cruise as we’re not in a hurry. On days like this we cruise for as long as it takes to get the batteries back to 100%. 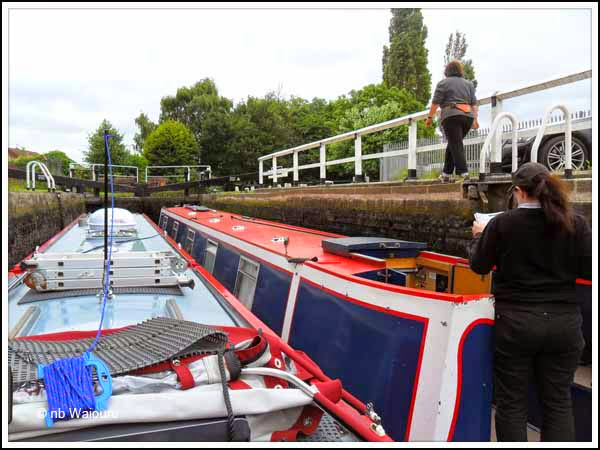 Whilst we didn’t move far there was plenty of exercise with nine locks to be done. 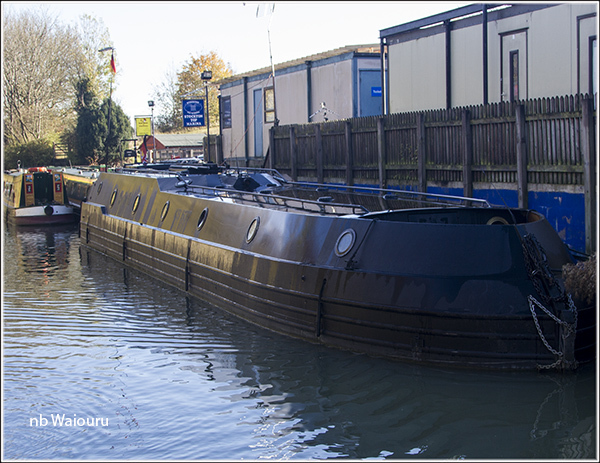 Stockton Top Marina is located above the top lock. The marina is probably best known for the location where James Bond keeps his boat. It really has that “stealth look”! Now we are on the Grand Union the locks are double width but as we weren’t in a hurry Jan only used the paddles on one side. It looked as If all the locks were going to be against us. However they fill and empty quite quickly. No doubt this is because they are “modern”, having being rebuilt in the 1930’s. Two thirds of the way down we met a Black Prince hire boat coming up which meant the last of the locks were in our favour. Ian and Julie have subsequently sold Dilligaf. However they live close to the Stockton Flight and regularly walk the towpath. 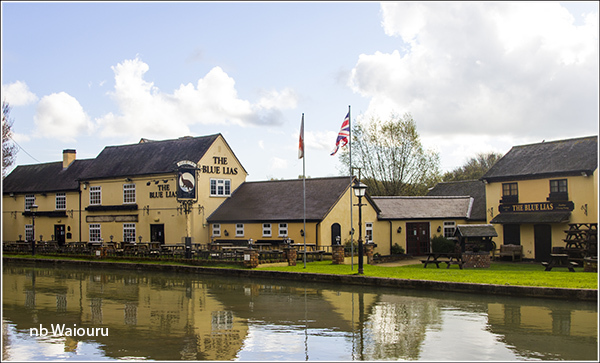 I was able to tap into their local knowledge and ask for their opinion of The Blue Lias pub which is located opposite the water point. Ian said the food was good but the prices were slightly on the high side. 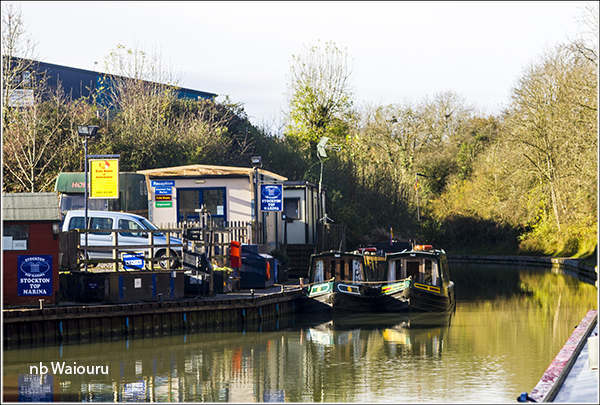 He recommended the next pub (Two Boats) which is located on the towpath side. Ian and Julie kindly helped us work down through the last two locks of the day before saying their farewells. It was a delightful surprise to see them again! Jan had put on another load of washing whilst we were on the move as it was a bright and sunny day with a clear blue sky. Regrettably the mercury fell 20 minutes prior to us mooring and then the sun did a runner! It had started to rain by the time we were moored and the laundry had been pegged out on the rotary line. The inside of the boat was also feeling cold until we lit the Refleks. It didn’t take long for the cabin to be so warm that we had to strip down to Tshirts and shorts. Braunston sausages for dinner. The very good news is to read Jaq’s (nb Valerie) last blog post and learn that, despite some communication problems, Les’ operation went exceptionally well.